District-wide or multi-school purchases are a very cost-effective way for your district to provide Premium Membership to classrooms in multiple schools. 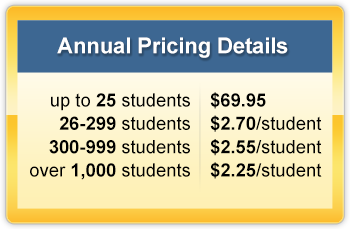 Pricing is on a cost-per-student basis, and we offer several pricing tiers to accommodate districts, both large and small. We can even assist you with setting up your teachers’ and students’ accounts. To ensure the most effective implementation of our program, we also offer professional development. Please contact us for details. To learn more about district-wide implementation, please call our office at 800-357-2157 or email sales@spellingcity.com. How do I generate a sales quote? We suggest contacting our Sales department. However, you can generate your own sales quote by logging into your account (or creating a new account) and entering the total number of licenses needed for your school or district. Select Purchase Order/Check as your method of payment, and a sales quote will be generated when you complete the transaction. Purchased licenses can then be distributed among your teachers. Who should I contact regarding district purchases? Call VocabularySpellingCity at 800-357-2157 and we will direct you to the account representative who handles schools in your area. You can also reach an account representative by email at sales@spellingcity.com.